La Greece et ses Colonies. 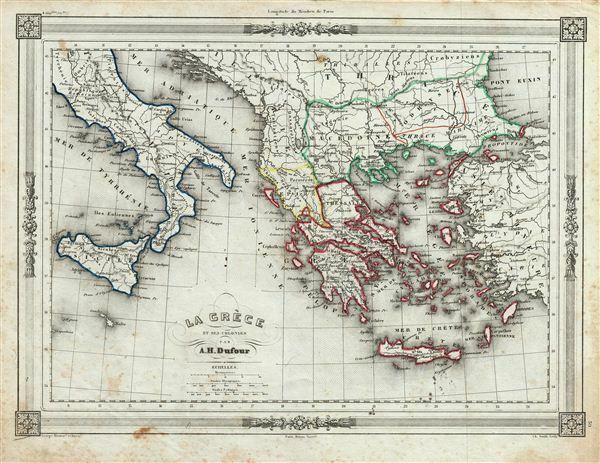 An uncommon and extremely attractive 1852 map of Greece and its colonies. The map covers from the southern part of Italy, including Sicily, to the western part of Asia Minor and from Macedonia to Crete. Throughout, the map identifies various cities, towns, rivers and assortment of additional topographical details. This map, made when the Ottoman empire controlled much of the region, covers what is today Italy, Turkey, and Greece, as well as the Balkan states of Bosnia, Serbia, Romania, Bulgaria, Macedonia and Albania. This map depicts the waning years of Ottoman hegemony in the region, with the Greek nationalist movement attaining independence for the Peloponnese in 1821. The Ionian Republic, under the protection of Great Britain, was also free of Ottoman control. The other Grecian and Balkan states, including Serbia, Croatia, Moldavia, Wallachia, Albania, and Macedonia, remained at least nominally under Ottoman control until 1878. The map features a beautiful frame style border. Prepared by A. H. Dufour for publication as plate no. 59 in Maison Basset's 1852 edition of Atlas Illustre Destine a l'enseignement de la Geographie elementaire.